I had this request the other day, and I remembered that it’s time to put up my hot cherry and jalapeno peppers. This is the simple method for preserving those hot beauties. I love having them around all winter, to eat with sandwiches, or stuff with cream cheese or ham to serve at a party. *Note: May use a variety of peppers to equal 5 pounds (4 quarts). Procedure: Wash peppers. I like to leave my peppers whole, and cut a small “X” across the bottom of each pepper. Stem and core large peppers. Pack one clove garlic and whatever peppers you have tightly into clean, hot, sterilized jars, leaving 1/2-inch headspace. Combine vinegar, water, salt (and sugar). Bring to boil and reduce to simmer. 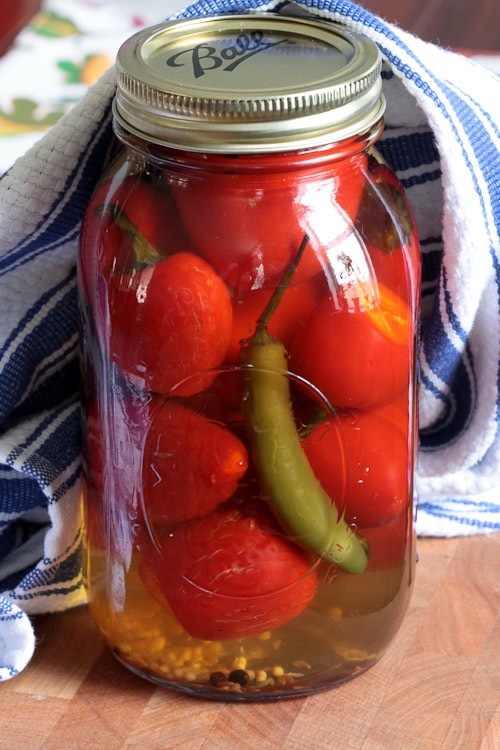 Pour hot pickling solution over peppers, leaving 1/4-inch headspace. Push the peppers down firmly in the jar to remove all the air bubbles. Work the hard in the jar to get the brine inside the peppers, and keep pushing until no more bubbles rise to the surface. Readjust headspace to 1/4 inch. Wipe jar rims. Add pre-treated lids and process in boiling water bath. For best flavor, store jars five to six weeks before opening.